Ecclesiastical, Medieval, and Neo-Latin Sentences offers students a wealth of Sententiae selected and annotated to pair with each of the 40 chapters of Wheelock's Latin. In addition, 16 Loci Immutati offer readings from the Bible, St. Augustine, St. Thomas Aquinas, St. Bonaventure, and more. Although designed to accompany Wheelock's Latin, this text is a great resource for anyone interested in reading Ecclesiastical, Medieval, and Neo-Latin. The thorough notes found in this text make reading these Latin selections possible and enjoyable for readers from any Latin background. 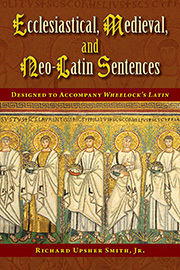 The PERFECT companion to Wheelock’s Latin for readers especially interested in ecclesiastical Latin and as a classroom resource for all teachers who use Wheelock.